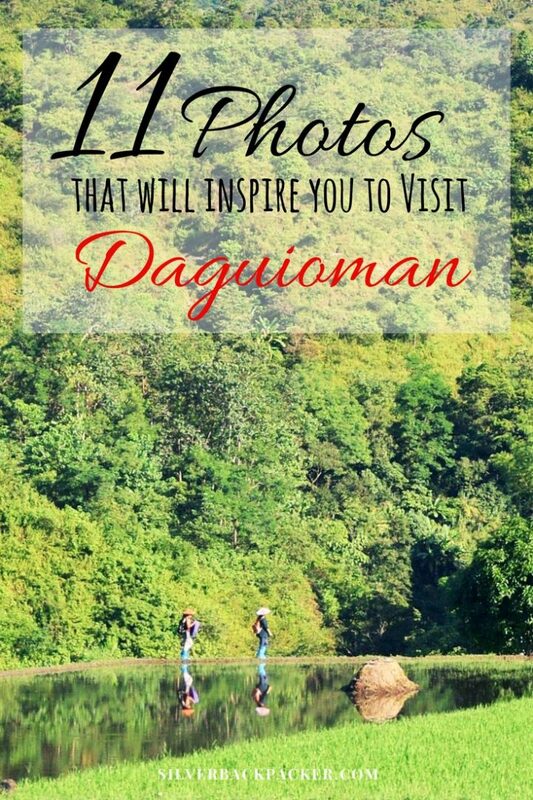 Daguioman is one of the Hidden Paradises of the World. 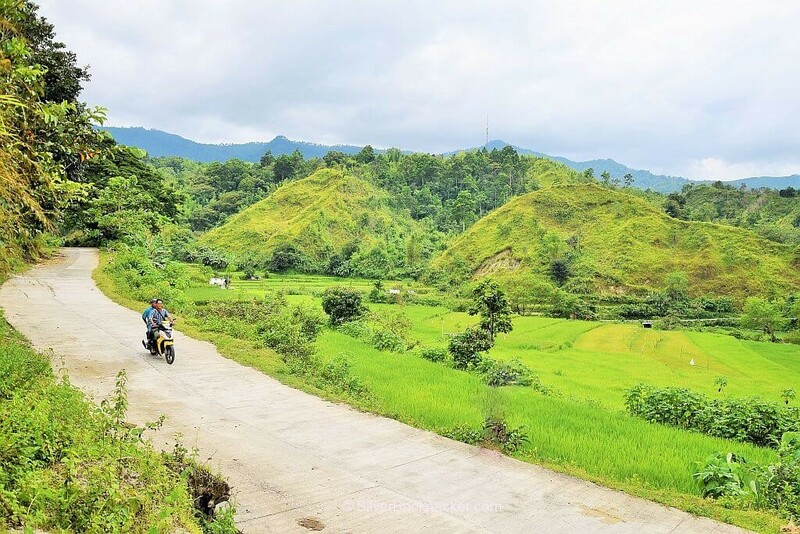 Nestled in the eastern part of the Province of Abra in the Philippines it had been isolated for many years until recently when roads and bridges were built and improved. Even so, Daguioman is still off the radar of main stream tourism for the moment. 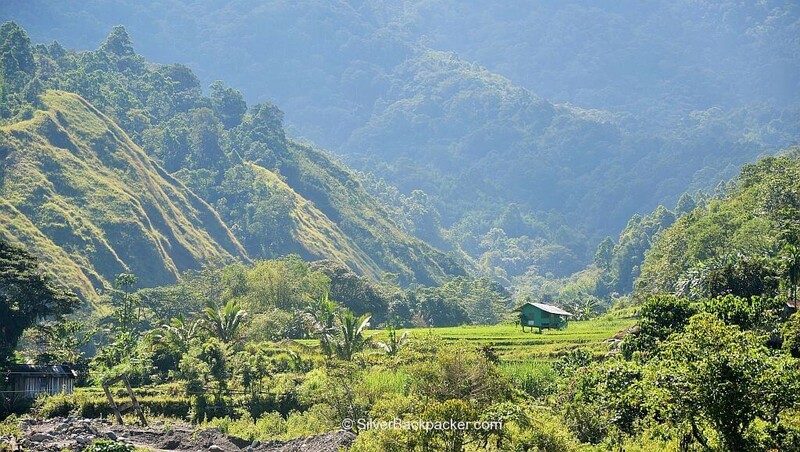 Its hidden secrets are slowly leaking out into the outside world making the Province an ideal retreat from the stress of daily life in the Metro. With this short photo essay of eleven images, I hope to give you some idea of what to expect, if and when you eventually make it to the Hidden Paradise of Daguioman. And if you don’t manage to travel there, then at least you will know what you are missing.!!!! St. Athanasius Church. 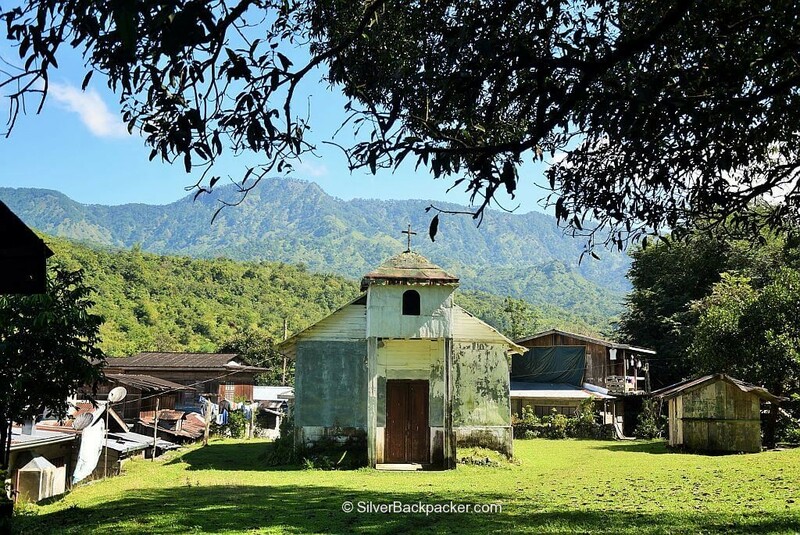 A charming old little wooden church sits at the entrance of Barangay Pikek, Daguioman’s first town center. There is a quaintness to its being small and simple and having the mountains as its backdrop. Known to be built in the 1920’s, it still uses the original pews, altar, confessional, images and a bell which is marked 1933. 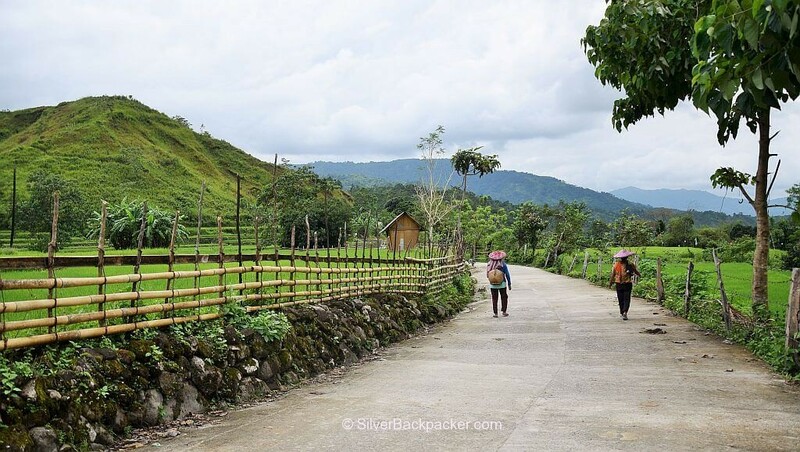 The local townsfolk of Daguioman walk from barangay to barangay. It took me almost an hour to walk from Pikek to Tui-Poblacion then to Ableg. It also meant almost an hour of picturesque views of mountains-fields-rivers scenery. One can never have enough it. 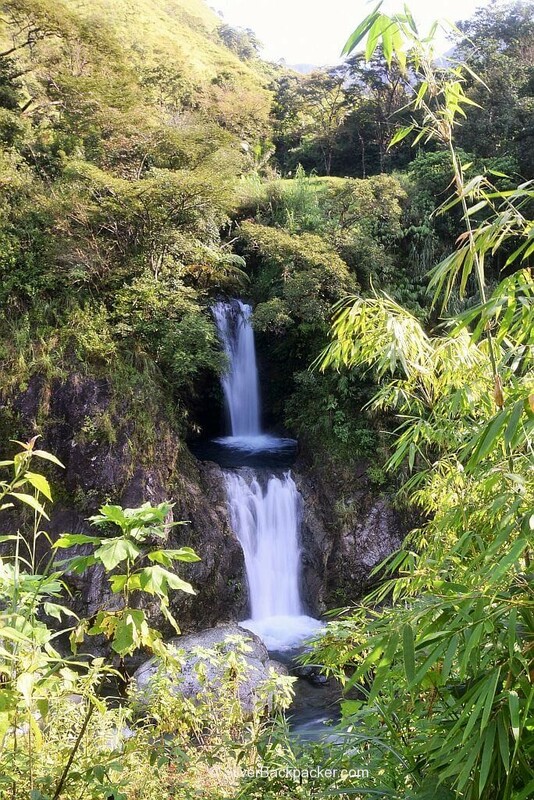 Labo Falls. 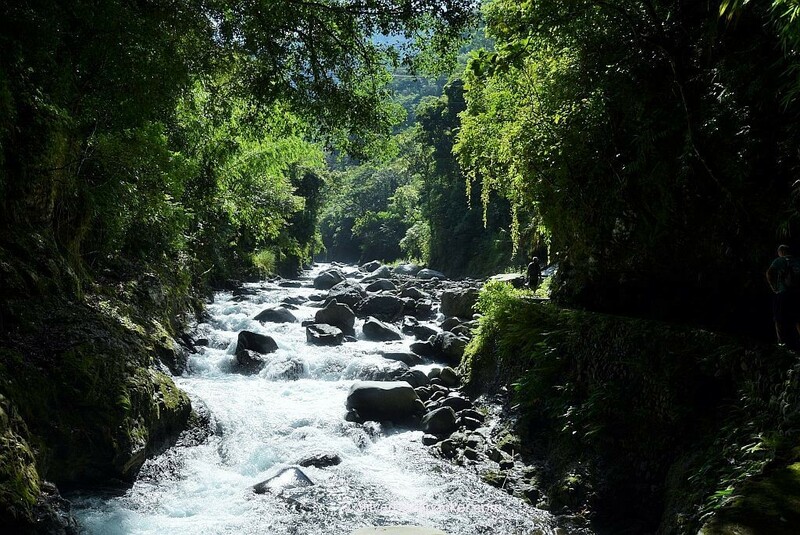 The path leading to Basakal falls is nothing but scenic and refreshing. Somewhere along the way, amid the green hillside, you will be greeted by a two-tier waterfall, pouring itself straight into to the river. Basakal Falls. This is not a gentle kind of waterfall. Its stream is mighty. Boulders stick out of the water at the entrance to its pool, somehow slowing down the current on its way out to the river. One side of the big open dome-like enclosure most of the time is wet from the splash of the falling water. Its water is refreshingly cold. Basakal falls is both beautiful and brutal. The Hills and the Fields. “Do you find it boring here?” our host asked after learning that we walked to and from Pikek, an hour walk from Ableg. In truth, boring was the last thing I could think of. 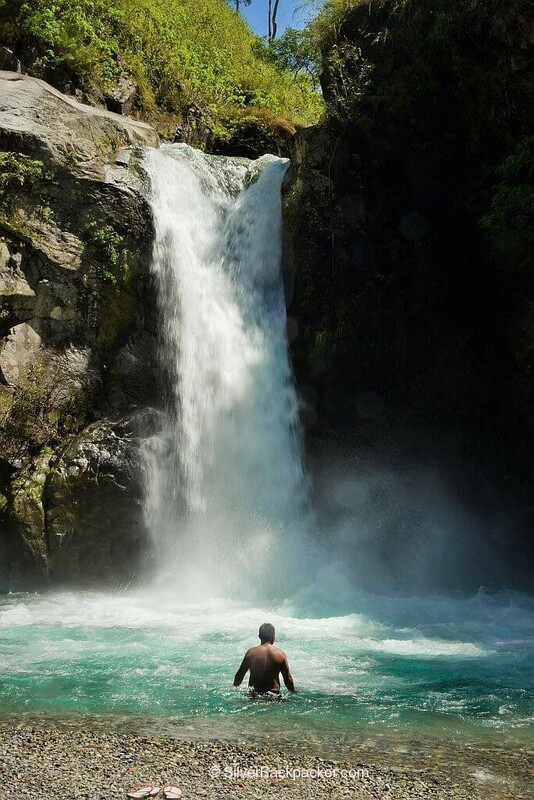 Daguioman is a refreshing discovery, the Hidden Paradise of Abra. Walking along the river early in the day is always a good experience. It’s that time when the sun is rising, slowly lighting up the surroundings and the sunlight feels good on the skin. The sound of the water, the singing of the birds and your footstep are the only things you’ll hear. 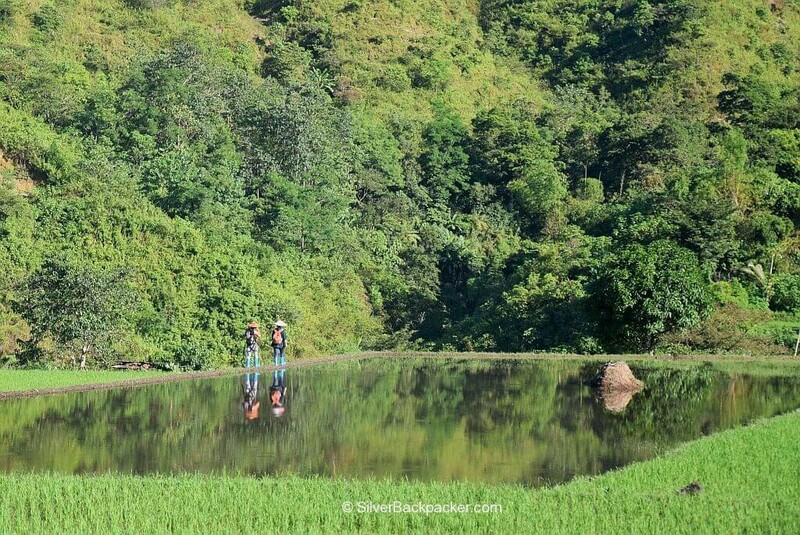 Rice Fields and Farmers. Most of the local people here, both men and women, are farmers. Farmers start their day early. These ladies were on their way to work passing through the fields. The only empty flooded paddy gave a reflection of Daguioman. 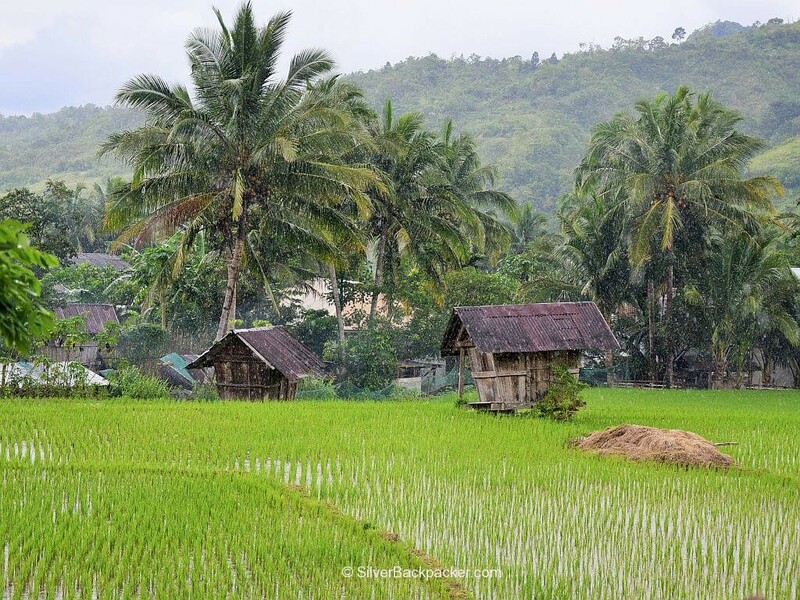 Rice Granary and Rainy Days. It may be unusual but one can enjoy a walk under the rain in the quiet streets of Daguioman. Take delight in the sound of the rain while learning more about a town that gets isolated at times. Young, Wild and Free. Chanced upon these boys who were running wild and free like the river. This part of the river was once made into a resort complete with cottages and cooking area. 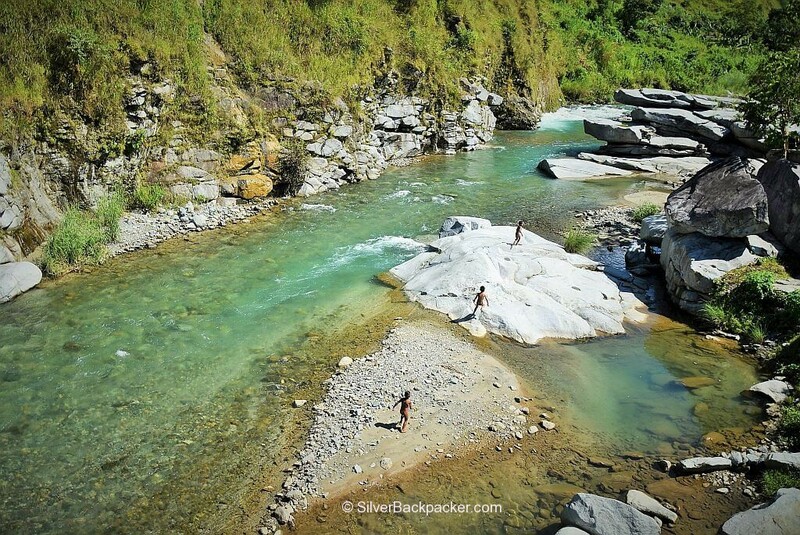 After a typhoon washed everything away, the river still draws people to bathe in its cold, free-flowing water, like how these boys seem to love it. Hanging Bridge. Where there are rice fields on the other side of the river, a bridge exists. Daguioman seemed to have taken care of all needed bridges and its people are putting it to good use. 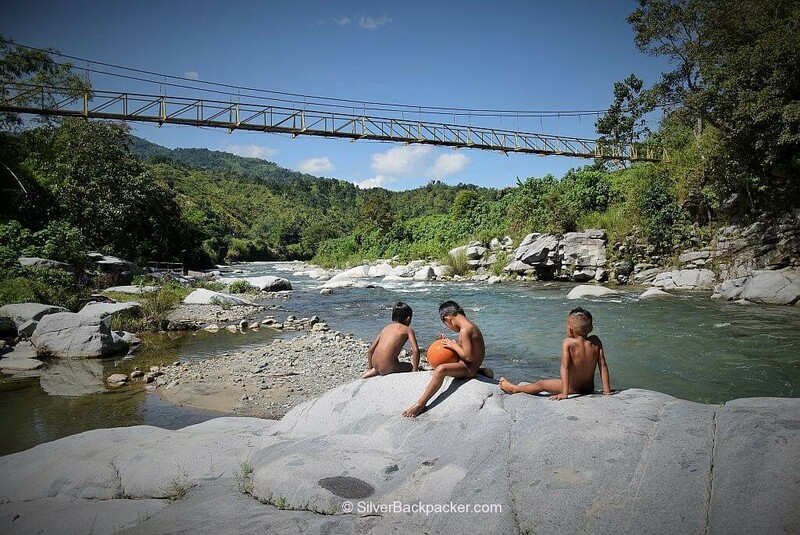 In this photo is the bridge which connects Barangay Cabaruyan to Barangay Pikek. Let’s Walk Home. After a day’s work in the fields, these women are walking home. 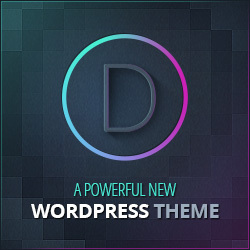 There’s a certain appeal to Daguioman’s laid-back but organized nature. Note All photos are the intellectual property and copyright of PaglaomDaily and may not be reused or published without permission. Did you like “The Photo Essay of Daguioman” ? If so then please share this page with your friends. Leave a comment below to let me know what you liked best.